Can you give me a ride to Garberville? WILD. I had to get over a few things in order to give Wild a fair shake: mostly my frustration at a protagonist defined largely by self-involvement and hubris and my inherent cynicism about what would appear to be an A-list actor's vanity project/attempt at another Oscar nomination. 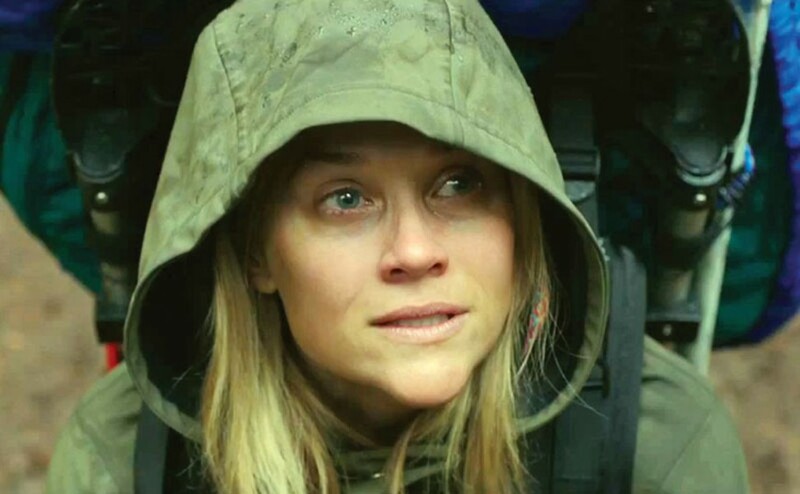 Reese Witherspoon, who plays Cheryl Strayed (a name the author pointedly chose for herself — one example of that afore-mentioned self-involvement) in director Jean-Marc Vallee's (Dallas Buyer's Club) adaptation of Strayed's memoir about discovering herself while hiking the 1,000-plus mile Pacific Crest Trail. Wild bounces wildly through the timeline of Strayed's life. It gives glimpses of the abusive marriage her mother flees with Cheryl and her little brother in tow; the loving, if challenging life the three of them go on to share; the destructive power of her mother's death; the marriage-destroying spiral of heroin and promiscuity following it. All of which are presented as signposts along the path that lead Strayed to the massive undertaking that is the PCT (without anything resembling preparation). Thanks to the humility and scale of Witherspoon's acting and Vallee's unobtrusive technique, Wild avoids many of its own innate trouble spots. This protagonist could easily become a caricature of a real person, a showy poor-me of IV drugs and back-alley rendezvous. Instead, Witherspoon strikes a delicate balance of vulnerability and ego that makes Strayed feel real. It's awards-bait, sure, but it is also a strong enough performance that one isn't constantly reminded of that fact. The movie isn't without its flaws. It could be called calculated and over-earnest, and the painful faux-lyricism of some of the voice-over almost wrecks it. But it explores grief, self-reliance, love and loss honestly and engagingly, narrowly avoiding arch-sentimentality and lethal self-importance. R. 115m. ANNIE. I dislike musicals, and generally feel that remakes are redundant, especially when they "update" material with which we are all familiar. I make every effort to combat my own preconceptions, but I still went into Annie expecting to hate it. I didn't hate it, though. Plucky little orphan Annie (Quvenzhane Wallis), under the care of a washed-up singer turned foster mother (Cameron Diaz), invests most of her hope in a note her parents left on a restaurant receipt when they abandoned her years before. She returns to the place every Friday, hoping to be reunited with her family. Meanwhile, self-made billionaire William Stacks (Jamie Foxx), something of an emotional recluse, is making a run for mayor of New York City. When Stacks and Annie cross paths, his campaign manager (Bobby Cannavale) sees PR gold. With help from Grace (Rose Byrne), his well-intentioned assistant, Stacks reluctantly brings Annie into this life. Song and dance numbers follow accordingly. While the story is as familiar as they come, and the whole breaking-into-song thing still bugs me, Annie is generally likable, if antiseptic and predictable. Foxx is a charismatic leading man with smart comic timing and great singing voice. Byrne plays sweet and shy about as well as anyone, and Cannavale's great in everything. Wallis, who broke out in the wildly over-praised Beasts of the Southern Wild (2012) impressed me with confidence and range. Diaz we can generally do without. This is harmless entertainment that produces a few genuinely touching moments. PG13. 118m. THE HOBBIT: THE BATTLE OF THE FIVE ARMIES. After the pleasant surprise of The Desolation of Smaug, with its jaunty pace and bracing action, this is a tremendous disappointment. What amounts to a two and half hour battle sequence somehow plays as under-plotted, busy and dull. The narrative drops straight into Laketown as the enraged Smaug lays waste to it. Bard (Luke Evans) proves himself a hero and becomes the de facto leader of the town's refugee population. Meanwhile, under the mountain, Thorin Oakenshield (Richard Armitage) succumbs to greed and obsession, distancing himself from his dwarf cohort and young Bilbo Baggins (Martin Freeman). The displaced people of Laketown gather at his gates, begging assistance, while masses of Orcs and Elves prepare for war. And Gandalf (Ian McKellen) is off doing battle with Sauron, etc. Before too long, the titular battle is underway, and the rest of the movie amounts to an unfocused series of fights to the death. Peter Jackson and company seem more focused on forcing this into the continuity of his Lord of the Rings saga than on telling the story of The Hobbit. By the end, there is no real feeling of having lost or gained anything at all. PG13. 144m. BIG HERO 6. A boy and his inflatable robot are out to save San Fransokyo with Disney-Marvel-level color and slickness. PG. 108m. BIRDMAN. Excellent weirdness as a former superhero franchise star (ahem, Michael Keaton) grasps at a second act. While his character struggles, Keaton clearly still has his chops. R. 120m. DUMB AND DUMBER TO. Dumbest. PG13. 109m. EXODUS: GODS AND KINGS. Holy Moses, this biblical retelling is long on time and short on surprises. With Christian Bale, Joel Edgerton and John Turturro with a spray-tan and heavy eyeliner. PG13. 150m. THE HOMESMAN. A strange, powerful, harsh Western about a woman with grit (Hilary Swank) and a sketchy feller (Tommy Lee Jones) transporting a trio of traumatized women back east. R. 122m. HORRIBLE BOSSES 2. Very funny people saving a less funny script in this kidnapping-and-ransom caper. R. 108m. INTERSTELLAR. A beautiful, ambitious movie experience about a pair of astronauts (Matthew McConaughey and Anne Hathaway) searching for habitable planets. Worth the three-hour investment. PG13. 169m. PENGUINS OF MADAGASCAR. The flightless foursome gets its own animated spin-off. They're spies on the trail of a villainous cephalopod. PG. 97m.